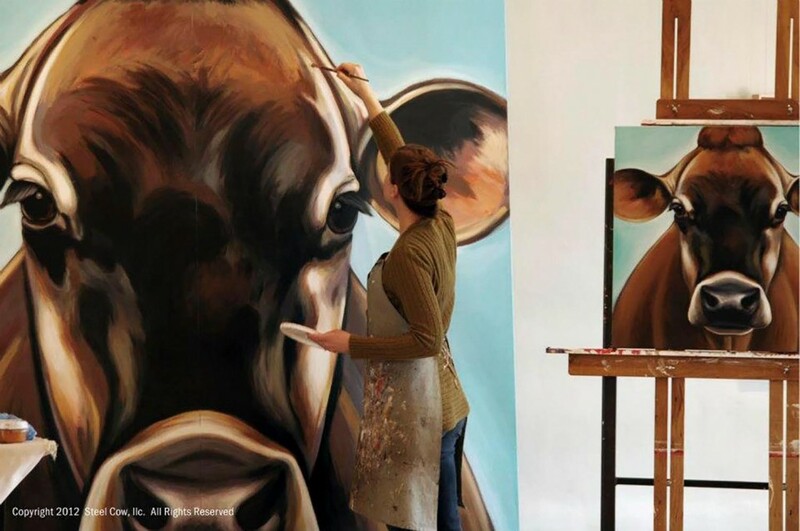 Although she is neither a dairy breeder nor a show ring competitor, artist Valerie Miller nevertheless is completely hands on in her relationship with cows. 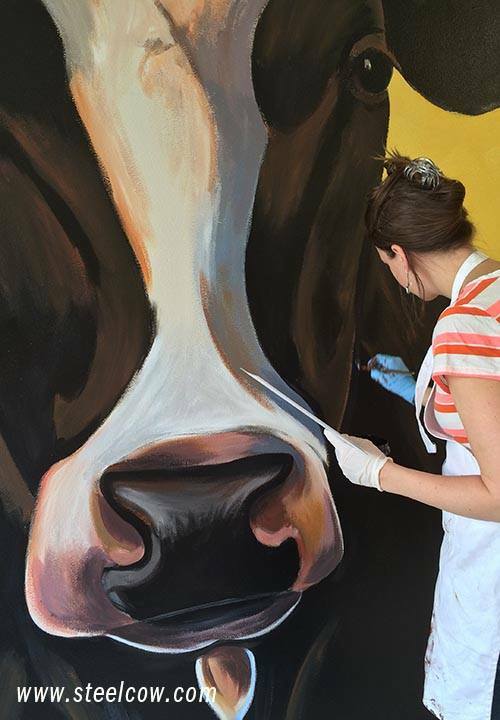 This passionate painter not only paints her girls larger than life but she also aligns their bovine characteristics with dear family members and friends. My husband and I met the first week in college, and about a week later we were pretty much inseparable. He was majoring in sculpture and I was majoring in painting. 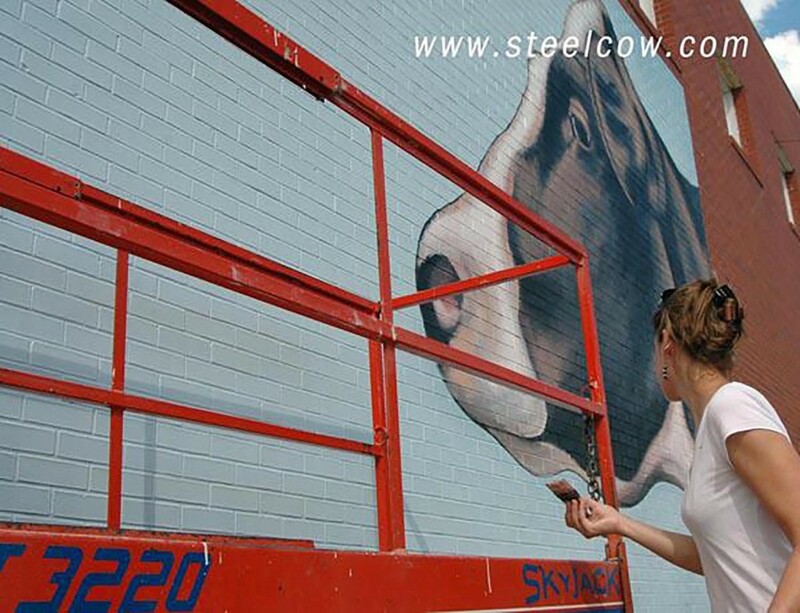 We used to talk about opening up a gallery/store together somewhere and so we came upon the name of Steel Cow as it was a combination of both of us – he was using a lot of steel in his sculptures and I was painting cows. After we got married in 2003, we spent a few months deciding where to locate. After countless hours on the internet looking at places and traveling around a bit, we couldn’t find “the perfect place,” so we decided to open a store in a family building in Waukon on a temporary basis.” For Valerie and Josh temporary is enjoying an extended stay in this rural town. Every painter feels a connection to the painted subject matter. Valerie is emphatic. 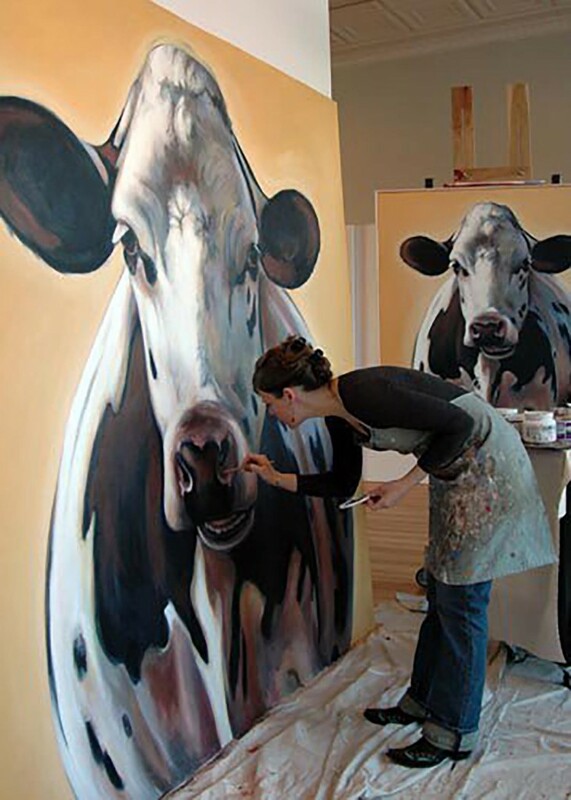 “One thing I will always do is paint cows. 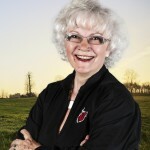 As long as I am creating art in a way that is enjoyable, challenging, and rewarding and am able to share that with others …… I will be happy.” That happiness has brought her close to all of her cow girls. So much so, that choosing a favorite is difficult. “Oh, that’s a tough one!” she admits. “It depends on the day. I like each painting to be better than the last, but that doesn’t always happen. As a cow, I like Queenie the best as she was the perfect matriarch of a local herd of dairy cows. I really like Virginia (she is chewing) and she reminds me of my great aunt who was always eating. I kept the original painting of Virginia and have her hanging in my kitchen. I am also fond of Dorothy as I first fell in love with cows when I met some Brown Swiss. 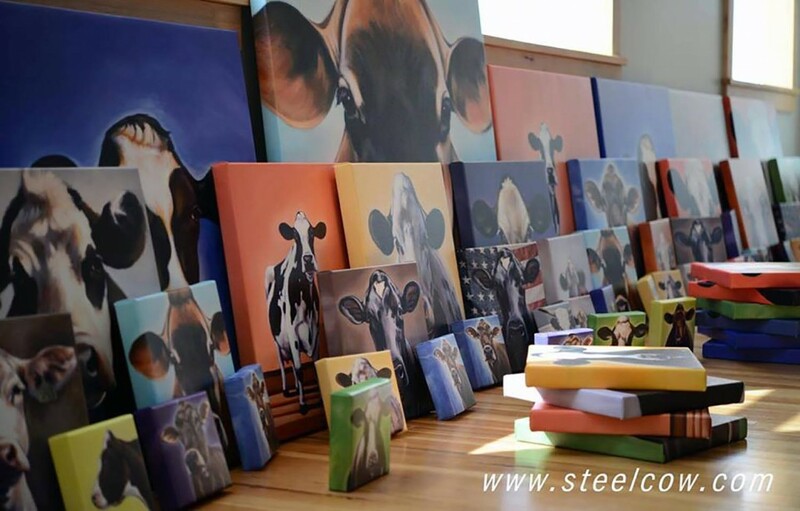 Since I call the cow paintings “The Girls” and name most of them after family and friends it’s kind of like trying to pick my favorite relative (in which case I should say Greta because she is my sister. )” It’s obvious that Valerie’s heart is a large part of her artistry. When you admire Valerie’s paintings it’s not about dairy conformation or bovine genetics. Valerie paints to capture the story. The story of the cow. The strength resulting from that connection is a celebration of hands on artistry. 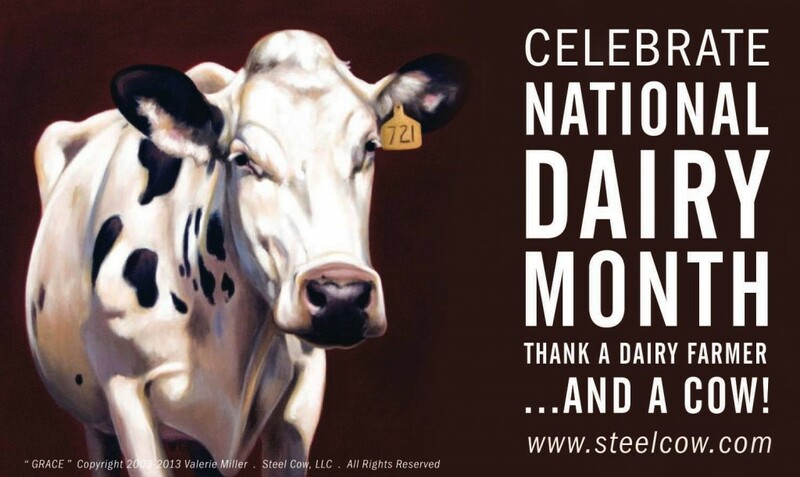 Steel Cows. The connection between cows and the people who love them. 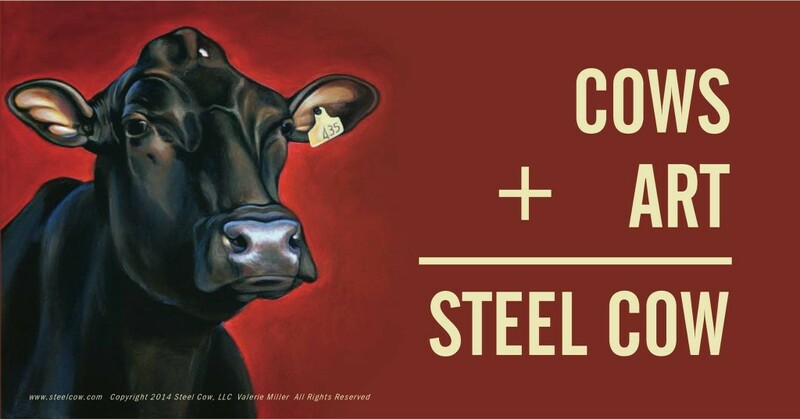 Be sure to check out the Steel Cow Facebook page as well. 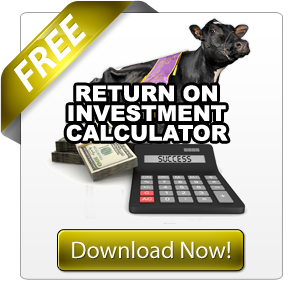 Who Killed The Market For Good Dairy Cattle? 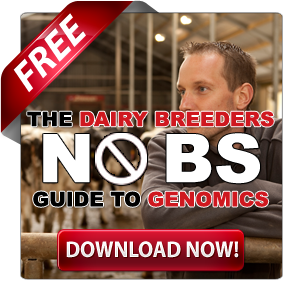 Is the Show Ring the Center of the Dairy World? 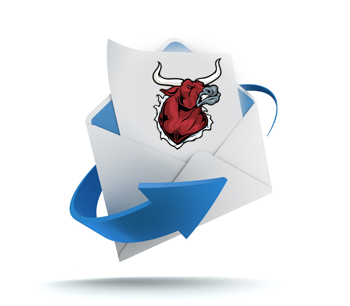 THE LEADERSHIP SHORT LIST: WHAT is it? Who’s On it NOW? Do we NEED It? 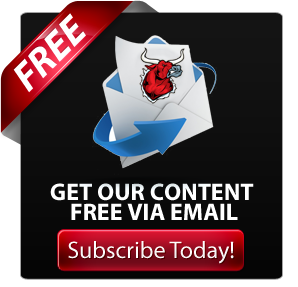 Has the Purebred Dairy Industry Lost Its Leadership? A terrific article about a terrifically talented artist. Valerie does a wonderful job illustrating the various dairy(and beef) breeds and this article successfully illustrated not only her talent but also the smart and thoughtful woman that she is.